The choice of what to do on a sunny spring weekend in Seattle is often a difficult one. The area presents many superb options, which is one of the main reasons I love living here. I could go backcountry skiing. Or I could go rock climbing. Or I could go mountain biking. Or I could do all three. Any one of these choices would make for a good day’s outing; doing all of them would be even better. There aren’t many places in the country where you can fit this trio of mountain sports into a single day within 59 miles of your front door. My friend Andy was game to join me. We have a long history of enjoying a multitude of sports together. We started combining them 12 years ago when we guided rafts on the Wenatchee’s whitewater by day and climbed in Icicle Creek Canyon in the evenings. When he showed up at my house at 6:30am he was without a bike. It was a complicated story but I would have to complete the third leg alone. East of Snoqualmie Pass a bumpy forest road winds up to the northern flanks of Silver Peak. Snow covered the road so we started our ascent a little lower than I had anticipated. It was a spectacular morning in the central Cascades and we cruised up through shady glades to the open slopes below the summit ridge. Climbing straight up the final slope to avoid a cornice, we took a break on the ridge before dropping in for some fun turns in perfect spring snow. A little routefinding through the forest brought us back to the road and a crunchy accompaniment to a day in the mountains: a bag of Tim’s Cascade salt and vinegar potato chips. After some gear organizing and packing we turned west and headed back down the pass to Exit 38. It’s not a glamorous name for a climbing area but it has the sunniest crags around. A hike through secondary forest brought us to the rock and the crowds that had ventured out to climb it. We found a few open routes at Eastern Block and had a lovely time doing laps on those. 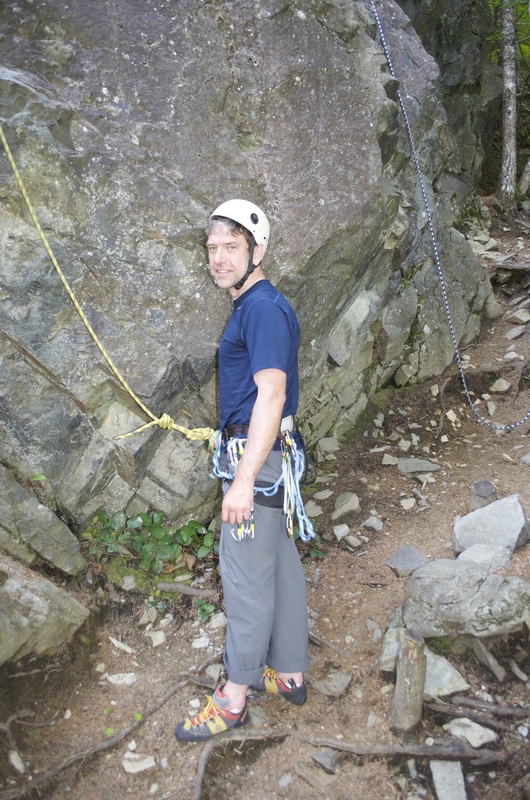 Despite the bustle at the crag that afternoon everyone seemed in good spirits: dry rock and bright sun signaled the start of another superb climbing season in the Cascades. Andy and I parted ways at the northern end of the Grand Ridge trail outside of Issaquah. It had been another fantastic day in the mountains with an old friend and we had shared many laughs along the way. Wondering if this was what the host of the Oscars felt like, I made my third outfit change and hopped on my mountain bike. The late afternoon sun filtering through the forest canopy sprinkled the forest floor in pools of light. Birds sang heartily, equally excited to have such a glorious day. Twenty minutes into the ride I wondered if I had the juice left in my legs to make it all the way out and back but I didn’t want to stop having come this far already in the multisport extravaganza. Powered by energy chews I made it the 1,000 vertical feet up the ridge. The descent was a fast, twisting pleasure. I arrived home exhausted and starving. I was delighted to discover a cookout in full swing in my driveway. Some neighbors and friends had gathered at Jenna’s invitation. No sooner had I dropped my gear in the garage than a plate of grilled goodies and a glass of Manny’s pale ale were handed to me- a delicious conclusion to an exciting day. What future multisport days could we plan for the summer?